You don’t really want to fall when you are skiing at 100mph, as Al Machell discovered last week. He caught an edge as he skied down a glacier, cartwheeled across the snow, and slid to a halt a couple of hundred metres later. Somewhere along the way, one of his skis splintered like matchwood, and he dislocated his left shoulder. The spectators watched in silence as a paramedic skied over to the figure slumped on the snow. He checked Machell over, popped his shoulder back in its socket, and helped him to his feet. A couple of minutes later, the 30-year-old IT consultant from Watford was back among his friends, showing off his shattered ski, and nursing a wheat beer to dull the pain in his shoulder. 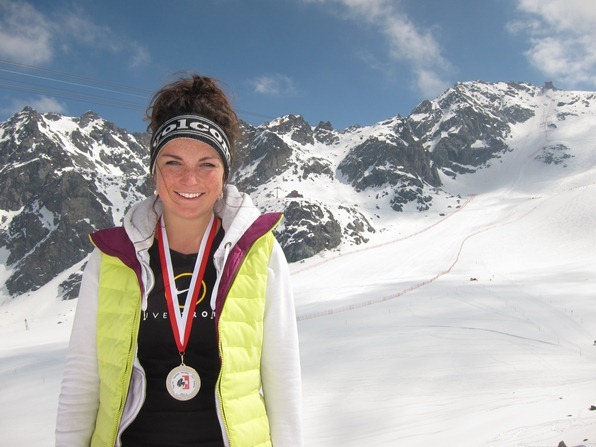 Al was training, along with fellow members of the British Speed Ski Team, for the World Championships held last week in the Swiss resort of Verbier. His injury prevented him from going on to compete alongside his team mates, but his spectacular fall has not put him off racing at breakneck speeds: in fact he wants to ski faster still. The races marked the end of a season not just for Al and his British team mates, but for the resort of Verbier, which closes its lifts and pistes this Sunday. The week packed in plenty of surprises, not just for Machell, and even a new world record – although not the one everyone was expecting. All of which left racers, spectators and the resort itself wondering – what next? 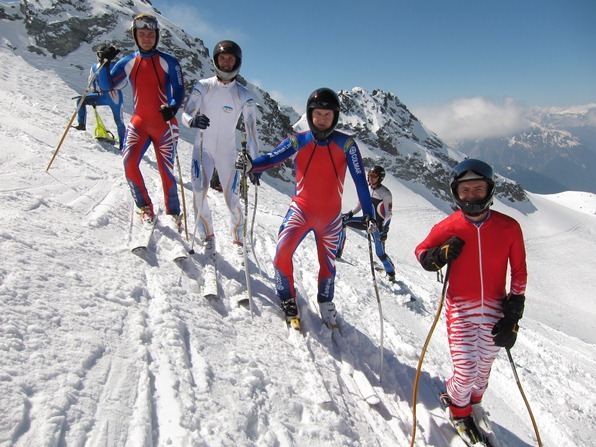 Rather than hanging up their boots for the summer, many talented skiers in the British Speed Skiing Team are preparing to knuckle down and begin training for the forthcoming season. 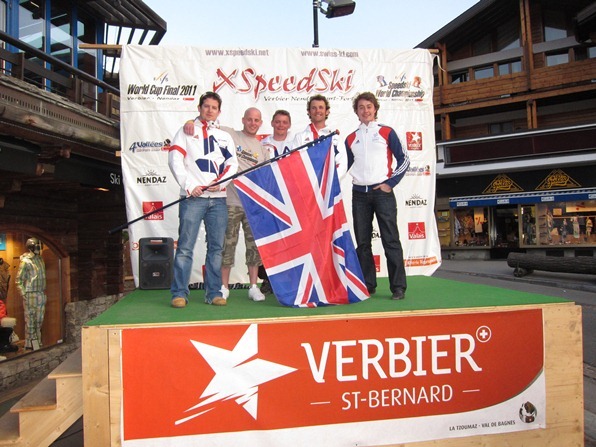 Millar Reid, coach of the British Speed Skiing Team, says speed skiing does not get the recognition it deserves in Britain, despite a slew of impressive results. A Scot of two decades’ racing experience, he holds a world record many skiers probably never knew existed – for indoor speed skiing, at 103.05 km/h. Hedley says he has ruled out the obvious option – “the pie diet” – and is working on his tuck instead, to make himself more aerodynamic. Over recent months he has taken up Bikram yoga – “which has helped a lot, I was the world’s least flexible person” – and has convinced his alma mater, Cambridge University’s Department of Engineering, to set up a graduate research project using a wind tunnel to investigate the aerodynamics of a speed skier – himself. 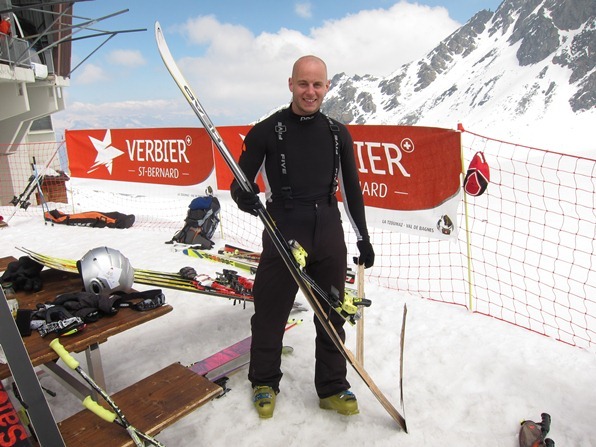 Hedley is also hoping to reap the benefit from some gifts he has received: some downhill racing skis from Roger Walker, who used to compete alongside Graham and Martin Bell, and a racing suit from Britain’s top female ski racer, the famously photogenic Chemmy Alcott. Considering that the cat-suit was tailor-made for the shapely skier, Hedley looks surprisingly convincing squeezed into it. The team-member who has made the fastest progress, perhaps, is 24-year-old Yannick Green, who over the course of a week in Verbier this time last year went from complete novice to No. 19 in the World Cup rankings. This time, he aim was to beat his personal best by a wide margin – which he did, by about 10kph, to clock 172.45 kph. 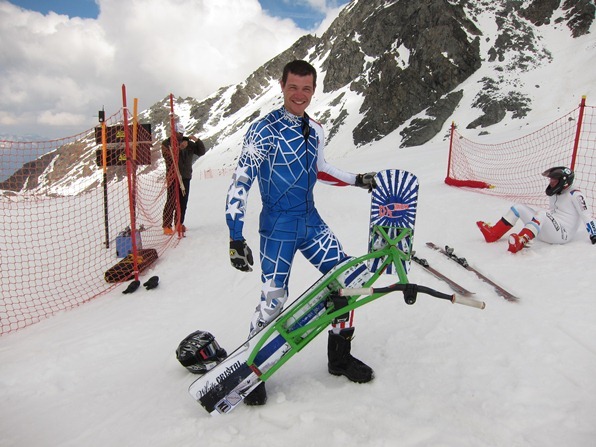 Britain’s most successful skier ever, arguably, is Marc Poncin – World Champion in speed skiing in 2008, runner-up in 2009, and holder of the British record at 245.23 kph. This October the 44-year-old is getting married, “looking forward to settling down.” Who knows, if Green doesn’t produce a winning speed skier for Britain, perhaps Poncin will in his own time. After a disappointing 13th place in Verbier last week, Poncin is retiring from competitive racing – although he says he still harbours a hope of launching a bid to break the world speed record (251.40 kph) for charity. He is not the only one with eyes on the record. Quite a few of the world’s fastest skiers gathered in Verbier thought they had a good chance this week – including the local skier Philippe May, one of only five people in the world to have skied at 250 kph. The occasion was last weekend’s SpeedMaster contest, held on the same track as the World Championship – but from a higher starting point, offering correspondingly greater speeds. In the end, Philippe May was pipped to first place by the man who had also won the World Championships, Simone Origone of Italy – but the previous record, established by Origone, remains intact. And all because of insufficient snow. 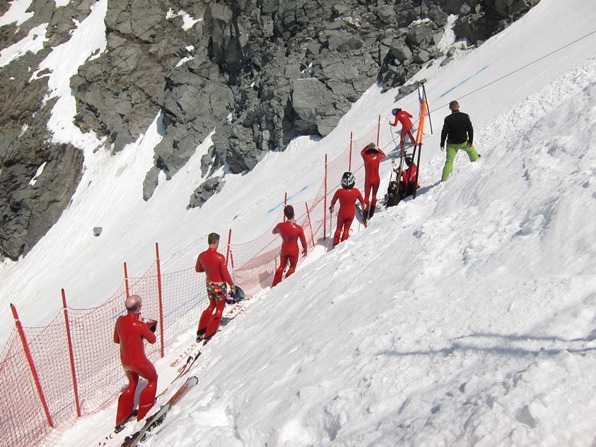 Which is ironic, because in a daring bid to make the run longer and faster, the organisers had built an artificial starting ramp and lowered it onto the top of the glacier by helicopter. However, the season’s low snowfalls had left the stretch of track immediately below the ramp dangerously rocky – so that the racers had to begin lower down. One record did, however, fall last week: smashed by a Frenchman riding something that looks like a cross between a BMX bike and a snowboard sawn in two. 28-year-old Corentin Desbois has his own factory for making snowscoots and normally spends his free time practising tricks such as his trademark front-flip 360, which you can see on his website. Last week, however, he rode one of his snowscoots down the glacier at a hair-raising speed of 153.49 kph – and straight into the record books. 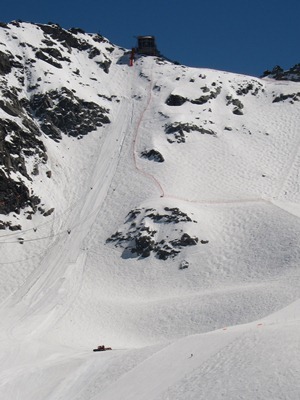 The ramp remains, and anyone riding to the top of the Mont-Fort over the next 12 months can see it: a stomach-churningly steep chute, carpeted in red plastic, plunging from the cable car platform down to the surface of the glacier. It will stay in place until next year’s races, when May, Origone and their rivals will once again attempt to set a new world speed record. Now, however, Verbier is turning its back on winter. As the last skiers depart, restaurateurs and hoteliers and preparing to take a well-earned break. The mountains will soon shake off the last of the snow, and before long, hikers will be once again scaling the summits. I will miss winter in the mountains, and writing about the many special people who live and pass through here. There are many more whose stories I want to tell, and I know it won’t be so very long before the snows, the skiers and the snowboarders begin to trickle back. I can’t wait. 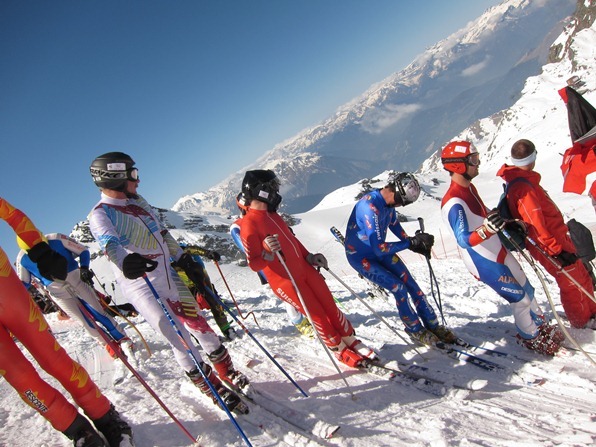 In the run-up to the Speed Skiing World Championships in Verbier, amateur skiers have the chance to hurtle down the same course. Are they mad? What makes a skier into a speed freak? Are some of us born with the word “faster!” on our lips, or is every holiday skier a potential adrenalin junkie, awaiting a trigger that will unleash an addiction to breakneck thrills? 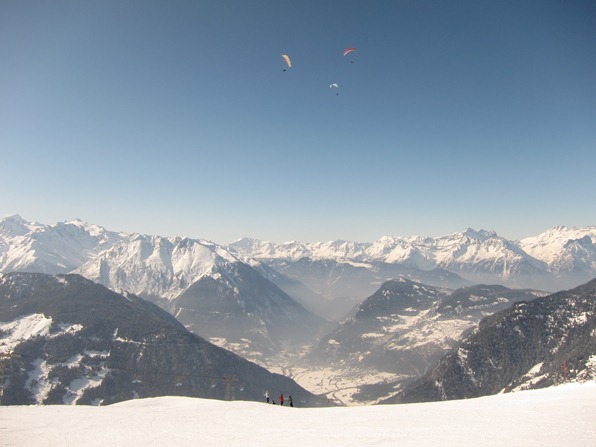 A good place to find out is in the Swiss resort of Verbier– notably in April, just before the world’s fastest skiers gather to race on the Mont-Fort. Last weekend, on the eve of the Speed Skiing World Championships now taking place, the stomach-churning glacier course was opened to the public for the annual “Pop KL”. While seasoned racers will nudge 200kph, novices are told they can expect speeds of up to 150 kph – or nearly 100 mph. 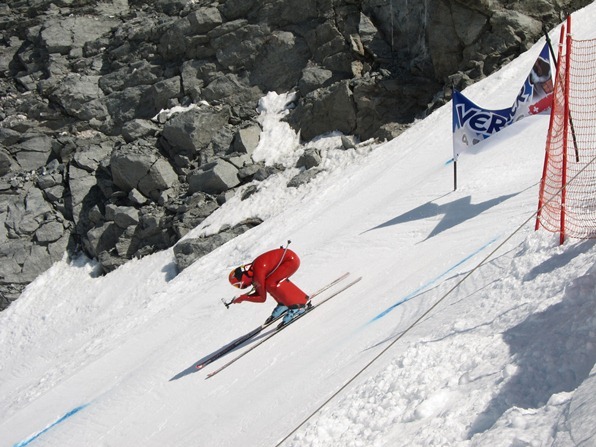 Which raises the question – what kind of leisure skier would do this? Do you have to be insane? To find out, I spoke to two novice racers: one woman and one man, both British, yet quite different in their approach. Marcus Bointon, 41, is from London, but lives near the French ski resort of Chamonix with his French wife and two children. He works from home, running an email marketing company, with clients in the UK. His story suggests that a craving for speed could be genetic. For the Pop KL, his first experience of speed skiing, he dug out the most aerodynamic pair of ski boots he had – a pair of rear-entry Salomons from 1993. The left boot was broken, so he found a replacement on eBay – “just £5, though it cost me three times that for shipping” – which is why he set off for Verbier with one black boot and one white. 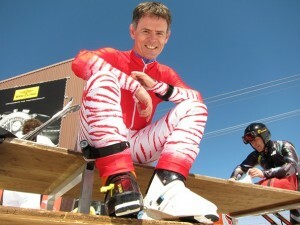 He also took with him a pair of downhill skis bought on eBay, 2.10 metres long – brand-new, 200 euros the pair. Reaching the starting point for the race is an adventure in itself: a ride up a cable car to the summit of the 3,330-metre Mont-Fort, followed by a traverse of the glacier – at this stage of the season, an icy field of moguls. The run itself is vertiginously steep, as smooth, white and scary as a blank sheet of paper in an exam. The scariest part, he says, was just before the first timing beam – when you are travelling at your fastest – and “where even the slightest changes of gradient feel like big bumps.” But he kept his nerve, and at the end of the long run-out learned that he had clocked 138.72 kph (86mph). Racers are allowed three runs, with a higher starting point each time. At the start of his second run, Marcus had a shaky start, but nonetheless scored 144.76 kph (89.9mph) – which turned out to be his highest speed of the day. “When I left home this morning,” said Marcus, “I told my wife I’d be very happy if I do 140, and ecstatic if I do 150. So I’m delighted.” Presumably his wife was very happy, too – especially that her husband was still in one piece. She told neither her colleagues at work – “I didn’t want them to come and watch” – nor her mother by phone – “I didn’t want her to be anxious.” Come Sunday morning, however, she was standing at the top of the glacier run, with a borrowed pair of 2.17-metre racing skis, the longest she had ever ridden. On that first run she clocked 118.39 kph (73.56mph) – comfortably above the speed limit on a British motorway. On her second, boosted by confidence, she reached 125.70 kph. For her third run, starting higher still, she took off her puffy un-aerodynamic ski jacket, for extra speed – and clocked an impressive 127.35 kph (79mph). For me, the most intriguing aspect of the whole day was witnessing a human transformation. 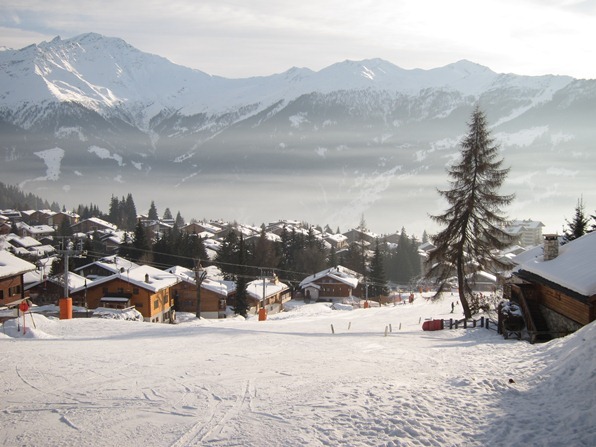 Earlier in the day, Alex had told me that, much as she had enjoyed living and working in Verbier, she did not know if she would come back: she was torn between plans. Those three runs changed everything. After the races, Alex told me she would definitely be back for next year’s Pop KL, would spend the season juggling sports massage with training and racing – and would love to join the British speed skiing team – “if they want me.” Not just a change of plan, then, but a change of life. So a taste for speed, it would seem, can appear suddenly, and quite unexpectedly. And once acquired, it would seem hard to shake off: witness the speed fanatics in Verbier now, from the British athletes competing in the World Championships to home-grown racers such as Philippe May, one of only five people in the world to have skied at 250 kph (155mph). You can find out how they all fare in next week’s column, the last of the season. Train tickets from the UK to major Swiss cities are available through Rail Europe (0844 848 4070; www.raileurope.co.uk); onward travel within Switzerland through the Swiss Federal Railways (www.sbb.ch). General travel information on Switzerland is available from the Switzerland Travel Centre (00800 100 200 30, www.MySwitzerland.com). How much of the Alps will remain unspoilt for future generations? 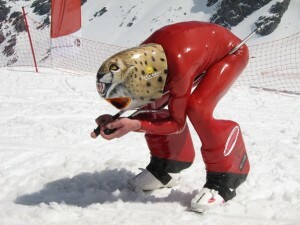 You come across all manner of unexpected sights on the slopes of a ski resort at the end of the season. On an Easter trip to the Spanish Pyrenees, I saw a piste melt over the course of a week into a meadow – revealing a fence whose posts consisted of ski poles, presumably harvested from the strip of grass below the chairlift. Such efficient recycling of the debris dropped by skiers is to be admired, but some of the litter dropped by skiers and snowboarders is of no use to anyone – and often toxic to the environment. According to The Summit Foundation, a Swiss organisation established to help protect the country’s nature and scenery, as many as 30,000 cigarette butts can be found under a single chairlift at the end of the season. 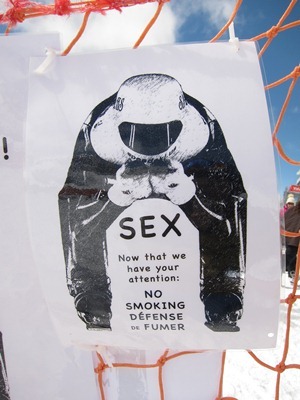 Whether you are a smoker or not, you will be welcome to join one of the many spring-cleaning operations organised over the coming weeks at ski areas in Scotland, the Alps and beyond. These usually take place after the official end of the season, and welcome visiting hikers and other holidaymakers as well as local volunteers. The Big Spring Clean at Scottish resorts is organised by the Ski Club of Great Britain (0845 45 80780; www.skiclub.co.uk). Last year, more than 120 volunteers gathered more than 60 bags of rubbish, which ranged from a tin of sardines to a New York bus ticket. This year’s Big Spring Clean, to be held simultaneously at CairnGorm Mountain, Glenshee and Nevis Range, is on Sunday, June 12. This clean-up is part of the Club’s Respect the Mountain campaign, established to raise awareness of environmental issues throughout the ski industry – and to show skiers and snowboarders how they can make their holidays more eco-friendly. The campaign’s opposite number in France, Mountain Riders, is the best source of information on spring-cleans at ski areas abroad. Last year this organisation and its partners mobilised 6,000 volunteers to collect 65 tons of rubbish at more than 160 locations. Many resorts have not yet fixed the date of their clean-up for this year, but as they do, details will appear on the calendar of operations. You can also search by resort. 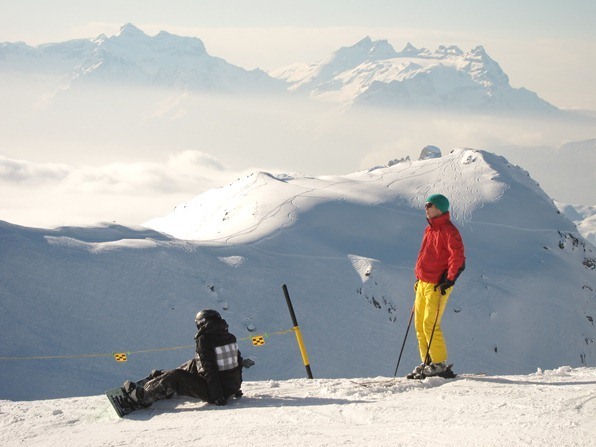 Both organisations offer plenty of ideas on how you can be a greener skier next season. 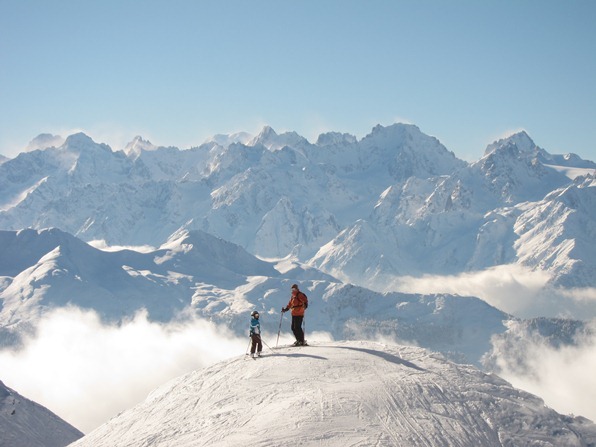 The Ski Club of Great Britain, for example, offers a handy online Green Resort Guide that allows you to examine the environmental credentials of more than 230 ski areas worldwide – and choose your destination accordingly. The guide is updated annually. Many of us will be upgrading our ski clothing or equipment between now and the start of next season, and it is worth thinking about the impact our choices have on the environment. You can find out more about how eco-friendly or otherwise different brands are in The Eco Guide to Mountain Gear, published by Mountain Riders. You can download a copy in English here– click on “Download the Eco Guide” on the menu on the left – or you can order a free printed copy from the Ski Club of Great Britain. The Ski Club also sells a variety of items to help fund its Respect the Mountain campaign, from T-shirts to ecological paraffin-free ski wax, available here. The shop also offers portable pocket ashtrays that it claims are the first ever to be made from recycled, recyclable and biodegradable materials. You can get a pack of five for just £2.50 (actually, 1p plus p&p). Now, how many would you need to stub out 30,000 fags? The Alpine Pearls association offers environmentally-friendly holidays in 24 resorts in various Alpine countries, including Switzerland’s Arosa. For detailed comparison of resorts in the USA, see the website of the National Ski Areas Association. A useful site for a wide range of environmental issues affecting ski resorts is the website of the Alpine Convention on Climate Change. Some tips on travelling to Switzerland with skis, snowboards and other outsize items. Given the trouble Laurel and Hardy had carrying a piano in ‘The Music Box’, you might think twice about attempting to bring one across Europe and up a vertical mile to a ski resort. Perhaps travelling with a traditional upright piano – an instrument that in Stan and Ollie’s hands turned into a weapon of mass destruction – would be ambitious. But what about carrying a modern digital piano? It can be done, as I found out recently. Heaving the piano onto the luggage rack of Eurostar may have been a challenge, but wheeling it through the streets of Paris was a breeze, and gliding on the TGV through France and on Swiss trains surprisingly hassle-free. The only leg of the journey that nearly stumped me was the final one, up the mountainside from Le Châble to Verbier, when squeezing onto a gondola with my outsize luggage felt like playing a game of musical sardines. We made it into the resort, however – and thankfully the piano does still work. The experience was also a pretext for doing some research into a more practical question: how easy is it to travel on public transport with bulky baggage such as skis or a snowboard, and what can you do to make your journey smoother? Travelling with a piano is, surprisingly, a good way of finding out. A padded case for an 88-key digital piano is roughly the same size as a large wheeled snowboard bag (150 cm x 44cm x 23 cm). A packed piano, however, works out a lot heavier – around 28kg in all. The ease of the journey depends a great deal on the quality, extent and reliability of the public transport system in your destination country – and in this respect, Switzerland is unrivalled. Most of the main ski resorts are served by train, the remainder by postal buses whose timetable is integrated with those of the railways. Train journeys from the UK to Switzerland require a change of train – and station – in Paris. However, you do not necessarily need to cross the city. Eurostar trains arrive at the Gare du Nord, and a five-minute walk away is the Gare de l’Est, starting point for TGV Lyria services to Basel and Zürich – ideal for resorts in central and eastern Switzerland. I also took this route with my piano. Normally the most direct journey to Verbier or any of the resorts of the Valais would be via Lausanne, but TGV trains depart from the Gare de Lyon, a two-stop trip from the Gare du Nord by RER. Instead, I travelled via Basel. Although this meant a longer journey, the cost within Switzerland need not be any higher, thanks to the fixed-price Swiss Transfer Ticket (see above). Transporting bulky baggage on TGV trains and Swiss railways is fairly straightforward: all have storage areas, and as long as you can carry on the luggage yourself, and it doesn’t block the corridors, staff do not bother you. The situation with Eurostar, however, is different. With the exception of the direct Eurostar ski train to France’s Three Valleys and nearby resorts, Eurostar does not permit passengers to carry items of luggage that are longer than 85 cm – which rules out most winter sports equipment. Instead, you are officially advised to use Eurostar’s registered baggage service, and collect your equipment on arrival at Paris Gare du Nord. The catch is that your baggage may not travel on the same train; Eurostar only guarantees that your luggage is ready to collect in Paris within 24 hours of registration. A couple of days before taking my train to the Alps, I visited St. Pancras for clarification. I spoke to several members of Eurostar staff, and they all said the same: that plenty of travellers turn up at check-in with ski and snowboard equipment, and carry it on board themselves. Staff did, however, suggest allowing plenty of extra time for check-in: turn up at the last minute for a train that is heavily booked, and you may not be allowed to carry on your bulky baggage with you. Confused, I contacted the office responsible for dealing with registered luggage: EuroDespatch, located at the back of the station. A member of staff confirmed the official regulations. Why the 85cm rule, I asked? He said that long items of luggage potentially posed a safety risk, because of the high-voltage overhead cables. Gosh. Does that mean I could get electrocuted via my metal-rimmed spectacles, which must be about 1.60m off the platform? I found the other reason he gave for not letting passengers carry ski bags on board more plausible. The bags can be used to carry ski poles, he said, which could be considered “a dangerous weapon”. Anyone who has been to a ski resort at half-term, and found themselves in a lift queue with boisterous French teenagers, knows the painful truth of that fact. In the end, when it came to setting off with my piano, I decided to chance it, as many skiers and snowboarders do. I checked in early, and was waved through. As I was one of the first on the train, I easily found space on the overhead rack to put my piano – though heaving the 28kg case up there took practice. The walk in Paris from Gare du Nord to Gare de l’Est took in a couple of pedestrian crossings, the odd kerb, and a short flight of steps – all manageable for an able-bodied traveller. Both the TGV and the Swiss trains had overhead racks with widely separated partitions where I could store the case, and only the gondola up to Verbier posed a serious logistical challenge. So, the trip was a success. And now the piano is safely unpacked in my room, only one question remains. Where on earth am I going to keep it? Rail Europe (0844 848 4070; www.raileurope.co.uk) offers through tickets to Basel, Lausanne and other Swiss cities. A return from London to Lausanne costs from £150. To plan a journey in Switzerland, use the online timetable (www.sbb.ch) and simply enter your time and place of arrival in Switzerland and your final destination to receive a detailed travel plan – including sectors by bus, cable car, gondola or boat, as necessary, and ticket prices. Rather than buying a return ticket, it may be cheaper to buy a Swiss Travel System pass – but you need to order this in the UK. For a ski trip, the best deal is often the Swiss Transfer Ticket. This costs £79 return (2nd class), and is valid from any airport or border crossing to any resort; with an additional free Family Card, children up to age 15 accompanied by at least one parent travel free of charge (www.swisstravelsystem.co.uk). For more information about tickets of the Swiss Travel System, contact the Switzerland Travel Centre (00800 100 200 30, www.MySwitzerland.com). You can, of course, shorten the journey by flying. In terms of transporting ski or snowboard equipment to Switzerland, the best deal I have come across is from Swiss (0845 601 0956; www.swiss.com), which will carry one piece of winter sports luggage free of charge on top of your normal baggage allowance (20kg in economy class). Most other airlines charge extra. British Airways (08444 930 787; www.ba.com) offers a one-bag allowance of 23kg in Euro Traveller class; extra bags are charged at £28 per flight when booked online. Easyjet (www.easyjet.co.uk) charges for all bags. One bag checked into the hold on a flight to Geneva costs £18 return; each item of sports equipment costs £20 single.